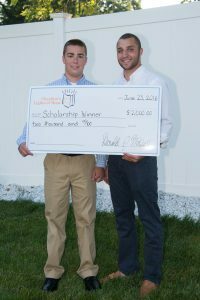 Cheshire’s Lights of Hope has selected Cheshire High School Class of 2016 graduates Justin Mercugliano and Peter Thomas as the organization’s 2016 scholarship winners. Each will receive $2,000 in recognition of their extraordinary community service. Cheshire’s Lights of Hope awards the scholarships annually to college-bound high school seniors living in Cheshire who best exemplify the organization’s mission of charity and volunteerism. Mercugliano, the son of David and Judith Mercugliano, and Thomas, the son of James and Karen Thomas, have a long history of service to the Cheshire community. Mercugliano spent two years as a junior firefighter for the town fire department and nine years as a student ambassador and volunteer for Cheshire’s Lights of Hope, where he sat on the executive committee. He also has served as a religious education teacher, usher and alter server for St. Bridget’s Church and as a tour guide and volunteer for the Cheshire Historical Society. As a member of Boy Scouts Troop 51, he obtained the top rank of Eagle Scout in March. Mercugliano has shown a deep commitment to assisting children with special needs, serving as a buddy/guide for the Cheshire Challengers baseball team and participating in both the Unified Sports Partner to Players program and the Best Buddies program at Cheshire High School. He plans to study nursing at the University of Scranton. Thomas also spent two years with the Cheshire Fire Department, serving as junior firefighter and junior captain. He was an active volunteer for the Cheshire Community Food Bank, Cheshire’s Lights of Hope, the Knights of Columbus and Abilities Without Boundaries. He was a five-year volunteer at Cheshire Arts Day, doing arts and crafts with children, and spent four years volunteering with the Cheshire High School Parent Teacher Student Organization. He plans to study criminal justice at Quinnipiac University. Founded in 2005 by Don and Jenifer Walsh, Cheshire’s Lights of Hope began among a small group of neighbors and expanded town wide in 2007. Through acts of kindness and generosity, the organization encourages good citizenship and promotes volunteerism while embracing and supporting local charities. The organization’s annual luminary event has raised more than $700,000 since its inception. Proceeds have gone to local organizations such as the Cheshire Community Food Pantry, Cheshire Department of Youth and Social Services, the Mari Hall Family Foundation and more, as well as toward scholarships for Cheshire students. For more information, visit www.cheshireslightsofhope.com.